Here’s a fresh single off of producer B Leaf’s forthcoming album featuring emcees, Akrobatik, Krumbsnatcha, and Weapon E.S.P. There’s a lighthearted vibe to the track but also a certain intensity brought by the emcees and scratched in by DJ Slipwax. I am not too sure about the project on a whole but I am sure we will hear something in the coming months. Enjoy for now. I can say, without hesitation, that Ruste Juxx has been on of the most prolific artists in the last few years. He has been featured donzens of times on other people’s projects. He has been on a a blistering pace of almost releasing two albums a year and V.I.C. is his second of 2012. His first project this year was with French producer Kyo Itachi, entitled Hardbodied Hip Hop. That album was outstanding and I thought Juxx had outdone himself with that effort but, V.I.C. expounds even further on that effort, making it one of the top notch albums of 2012. I believe one of the reasons this album shines so bright is the beat selection from producer, The Arcitype. 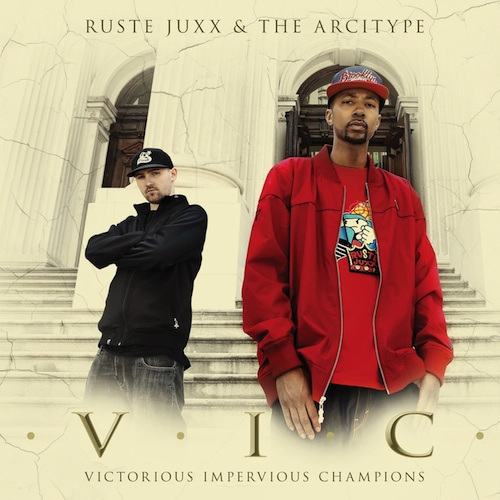 He is able to fuse different sounds together for an album that I really hadn’t heard before and that only enables Ruste Juxx to showcase even more of what he can do with the microphone. New music featuring 2011 Artists of The Year, M-Dot. The lead artist is Busy Bars who also is a very apt lyricist. The production is on some crazy orchestration, meant to be chaotic. It all just goes together.